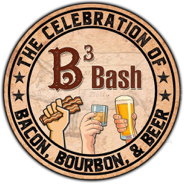 Enjoy three favorites with B3 Bash: A Celebration of Bacon, Bourbon, & Beer which will benefit Kosair Charities, on Saturday January 20 from 6 to 11 p.m. at Mellwood Arts Center, 1860 Mellwood Ave. Guests will enjoy bacon creations by 15 local chefs and restaurants, signature cocktails from Four Roses Bourbon and Woodford Reserve, a variety of craft beer from West Sixth Brewing, and wine from Old 502 winery. The B3 Bash general admission tickets are $80 (advanced purchase)/$90 at the door; tickets include all food and drink. Guests can save $5 off each ticket (advance sales only) by using the promo code: ‘kosairkids’.